Ingredients: Water/Aqua, Pyrus Cydonia Seed Extract, Alcohol, Glycerin, Triticum Vulgare (Wheat) Germ Oil, Anthyllis Vulneraria Extract, Borago Officinalis Extract, Cetearyl Alcohol, Prunus Armeniaca (Apricot) Kernel Oil, Arachis Hypogaea (Peanut) Oil, Chamomilla Recutita (Matricaria) Flower Extract, Simmondsia Chinensis (Jojoba) Seed Oil, Bentonite, Daucus Carota Sativa (Carrot) Root Extract, Propolis Wax, Fragrance/Parfum, Limonene*, Citronellol*, Geraniol*, Linalool*, Citral*, Eugenol*, Farnesol*, Lysolecithin, Xanthan Gum, Chlorophyllin-Copper Complex /CI 75810. 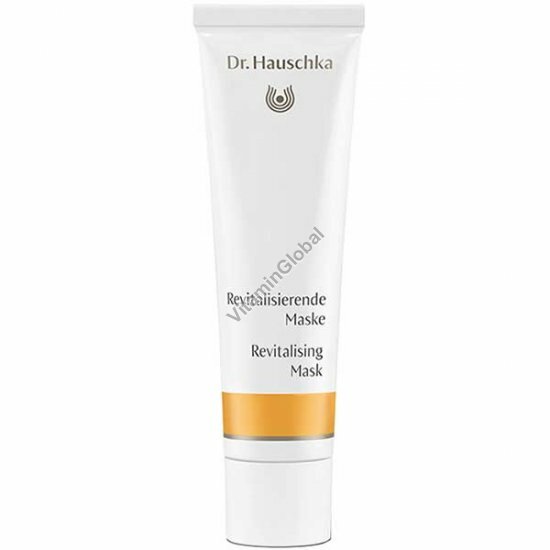 Usage: After cleansing and toning, apply a generous amount of Revitalising Mask to the face (include eye area), neck and décolleté. Remove after 20 minutes with a warm, damp cloth.